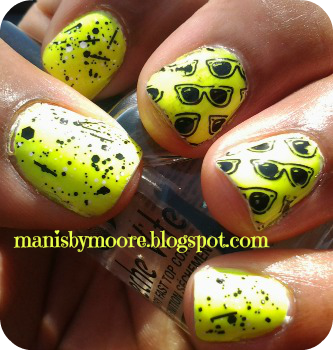 How cute are the glasses with the neon polish?? Oh my goodness I keep falling deeper and deeper in love with black and white glitters!! I finally found a shredded looked one on Etsy and it was on clearance! Clearance is the best way to buy polish! I purchased two more black and white glitters on eBay. The Nabi and Kleancolor brand. I actually purchased a whole set of 6 of Kleancolor matte glitters. The are so cheap only $6.99 for all 6. I hope they are nice when I get them. I will more than likely love them regardless... yeah I will. Do you like neon's?? How do you wear them?? On your toes or fingers or only an accent nail for those not as bold?? Thanks for stopping by! Tee hee your addiction continues! The sunglasses on neon are just too cute! And I'd love to see Kleancolor swatches - you can't get them here in the UK easily! This addiction is something else!! I will do my first swatch posts for you! !